I have not spoken with my own voice in nearly seven years. I knew this would be my fate long before it happened — but only now do I understand what it means. Another Nine Lands story, this one set in the same country as my Asimov Award story “The Legend of Anahata.” I’ve sadly misplaced the article that gave birth to it, but I recall that it had to do with an African culture — the Ashanti, perhaps? — whose kings had an attendant whose entire job was to repeat what the king said. The point made in that article was that this gave prestige to the king’s words, but my imagination took it in a different direction, one where the king’s voice was too ritually pure, and therefore too dangerous, to be heard by ordinary people. Thus developed one of my favorite features of Sahasraran culture: the tradition of women known as kingspeakers, who give up their own voices to take on the king’s. 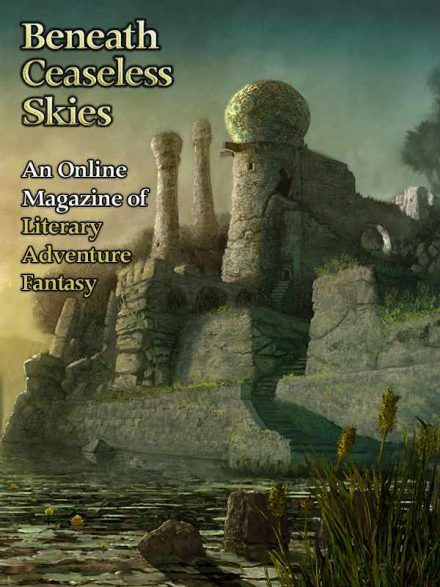 The story appeared in the third issue of Beneath Ceaseless Skies, in both text and audio forms, and was also recorded at Podcastle. Ordinarily I wouldn’t respond to someone else’s reading of a story, but in this case I have to say that this post touches directly on one of the things I consciously wanted to achieve with “Kingspeaker.” I don’t recommend reading that commentary before you’ve read the story, but since it’s free online, there’s no obstacle to checking it out first. Another good one, with just the right balance between worldbuilding and character and plot. Watching the interplay of the person and the role, both in the King and his Voice, was fascinating.